This was my big one; I’d been building up to it for months. The Tour of Edinburgh (55km) had been a practise run. Nothing really could prepare me for this day. It was just unbelievable. I’ve been going to the Lakes since I was tiny; it was our only summer holiday destination. We would stay in Glenridding, so I knew a lot of the route. I had also recced it in two parts, Askham to Patterdale once with Geoff and the rest by myself. However, reports of good navigators getting lost on Askham Moor concerned me. I’d packed my bag and checked it twice (mandatory kit and lots more layers just in case), charged my head torch, marked my map, set my compass for the all-important Askham fell crossing…even borrowed a watch from Stuart who had added the GPS route just in case it went horribly wrong. I woke at 4 am, ate my breakfast, prepared a few snacks and then sat in my car while it defrosted, wondering when on earth this behaviour became normal. I arrived at Geoff and Susan’s at 5:15. Susan had offered to drive. We arrived just past 7 to find the hall teaming with runners filling up on breakfast (a lot had camped out on the community centre floor). We registered and were given a race tag that would be scanned at all 8 checkpoints. We had to arrive at Side Farm, Patterdale from 9:30; we weren’t allowed to pass through any earlier. From my last and only recce I’d worked out I should be able to arrive in 1hr50, so wanted to leave at 7:45. Hopefully, the sun would be coming out and if I was lucky, dusk wouldn’t have fallen on my return. This seemed to be Geoff’s plan as well. After a thorough kit check, we scanned our tags and the race was on. 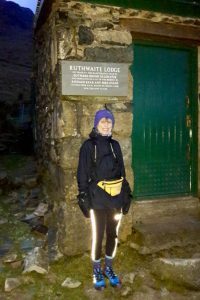 We opened the door to see the sun just kissing the sky, visibility was good, Susan was waiting to cheer us on and we were off up the icy road onto the track, through the gate and onto Askham Moor. It was an amazing morning, you could see over Ullswater, the mist just rising in places, the far-off fells white. There was no wind and weather conditions, apart from the temperature, seemed reasonable. I kept to a comfortable pace. A sheet of ice covered most of the paths and I had to go pretty slowly to work my way across anyway. On the safer gravel bridleway, I could pick up my speed. I was disappointed as most of this section is on good runnable trails or road so I had wanted to make sure I got these easier miles under my belt, however, the ice slowed progress. 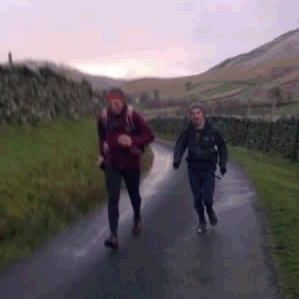 CP1, Martindale Church. There were a lot more runners than I expected. With the staggered start, I’d thought it would be quiet but the trails were relatively busy. On up to Boredale Hause and I passed quite a few as I tucked into my first flapjack of the day. Running down the hill to Side Farm I grew really frustrated as I slowed on the uneven surface and a few men flew past. With a concerted effort I caught the lady in front only to realise it was Ros, the organiser of the DT series, we exchanged a few greetings and I finally reached CP2, Side Farm, perfectly timed…1hr46! My card was scanned and the Marshall told me this is where I should look happy as he pointed/directed me towards all the food and drinks set up inside the warm tea room. I was slightly confused, the day had only just begun and I had a considerable amount of miles to cover yet. I continued on over the cattle grid and into Patterdale, I knew these little valleys so well, I felt happy coming back. I made a sneaky detour up through the Glenridding car park as most runners took the longer route (by a few 100m…every metre counts) up the main road; it gave me such pleasure to arrive on the road ahead of them. As I started the climb up to Sticks Pass the scenery became increasingly whiter as the ground was covered in more snow. The valley bottom was shrouded in mist and a light rain hung in the air. I stopped to put on my jacket knowing it would get colder as we climbed. I looked up and considered taking a more direct line to the top, but unsure I followed the majority along the zigzag path. CP3, Trolls Bridge. I’d looked forward to the pass, it’s got a lovely undulating path, which isn’t too strewn with rocks and isn’t so steep that you can’t run most of it. However, today it was covered with a thick layer of snow, in places going up past my knees. I tripped and fell into it quite a few times. 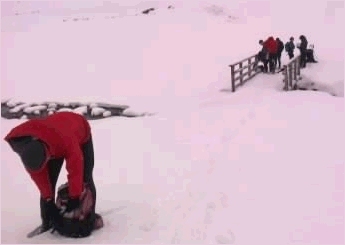 It was amusing to try to ‘run’ past people who were out for the day on their skis. This is obviously a big race day; quite a lot of the well-known fell runners were there. I was bewildered to see a woman pass me then stop to the side of the footprints to pull down her leggings and knickers and happily wee in front of all. Despite packing all but my kitchen sink I’d forgotten my sunglasses, which would have come in handy. The glare off all the snow was so blinding. I was pleased by the proximity of the other runners and that snow wasn’t still falling, although the mist clung to the valley making visibility quite poor. It would be really easy to go off track and get lost in this unforgiving white landscape. Finally, I reached the top. Next came the descent down to Thirlspot and CP4. Not as quick as I’d hoped, as the snow was really thick, as I struggled on the steep slippy descent. Katie (2nd fastest female BGR) and Nicky Spinks flew past. The views down this valley were just beautiful. Snow dusted the lower slopes, the tops were white, the low sun had a reddish glow and a mist danced along Thirlmere. I like the path here that winds along the stone walls, across little becks, the high fells flanking either side. At Swirls carpark I was feeling tired and cold so stopped briefly at CP5 to fill my mug with hot sweet tea and sipped it as I made my way up onto the forest tracks, pleased to make use of my early Christmas present, a foldable mug! This is my least favourite stretch, on my recce. I’d found it monotonous and was surprised by the roads that still twisted up the valley. The snow and views were beautiful today though, so I was happily distracted. I was busy following the trainer footprints trying to work out how many people may have passed this way before me. There didn’t seem to be too many, and here and there were the distinct prints of reindeer! Down to CP6 and then on up Raise Beck. I somehow managed to sink knee-deep in mud…about the only muddy square metre on the whole route, then hauled myself out to immediately skid on ice and land on my bum making my leggings v cold and wet and soaking my gloves. Thank goodness I had also packed my buffalo mitts! This knocked my confidence, as I now had to find a safe route over the beck without falling in. The rocks were either covered in ice or just very slippy. 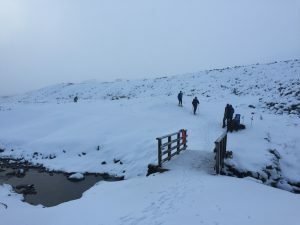 As I floundered about and skidded, nearly landing in the beck, some men who had followed my lead skipped past on the same route and headed on up the hill. I cursed them under my breath for their speed and sure-footedness. It wasn’t long before my spirits were lifted, seeing Santa sitting on a rock wishing us a Merry Christmas, just as Jules had said (I promise I wasn’t hallucinating). Much to my surprise, Susan was here too, hoping to spot us on route. She laughed when I told her how tough it had been and said Nicky wasn’t too far in front. I found it difficult getting the right line around the tarn, the snow was really thick. I tried to follow the trainer prints but it was slow going. Where it lay thinner I could run but most was a hard slog through thick, thick snow. The stunning views made up for it. On down the Grisedale valley and I was relieved to see the green slopes now not so far away. I chose completely the wrong route; coming down slowly on the path…I know time and places were lost. But again I found myself in familiar territory. I’d spent one summer trying to get fit with my brother, run-walking between these valleys. I’d gone on my tiny dinghy down the little beck and had been chased by feisty cows through a field. I’d been one of very few who had come here when foot and mouth disease had wiped out tourism and remember dipping my trainers at all the gates. I love this place, so while I was beginning to feel very tired my memories kept me going. The road did feel very hard going despite being predominantly downhill until CP7, back at Side Farm. A supporter gave me a massive cheer and told me to keep going, ‘just keep putting one foot in front of the next’…so that’s exactly what I did and I kept repeating it to myself all the way back. So now to retrace my steps. I felt quite daunted; I’d already been on my feet far longer than I ever had in a race. I wasn’t looking forward to the trudge up to Boredale Hause. I was flagging. I stopped again, filled my bottles with juice and took another cup of sugary tea up the path. I’d only been to the top of the Hause once with Geoff. I’d thought there was only one path to follow, unfortunately, it branches and I missed the quicker route, ending up circling around and back on myself. Panic rose as I didn’t remember the path; I was so relieved to find the ruined wall that marked the right route. Annoyed at myself and tiredness drifting in, I pushed on as hard as I could. I started having to make deals with myself, to run to certain markers and then walk, to set regular snack intervals. It’s still about 10 miles back; a long way after already completing 28miles. I was keen to reach the moor before sunset though, so this kept me pushing forward. Martindale CP8 done and only one left to go. I started to keep in time with two men who’d been running together. When they ran I ran, when they walked I did the same. It felt comfortable and it distracted me from my negative thoughts. I kept up with them until the cockpit stone circle. I was determined to keep on Geoff’s shortcut after that. The paths here scatter crazily across the moor. I knew I could go wrong. However, it wasn’t dark, the fog hadn’t fallen and I could see the trees that marked my way home (this was one of my major fears, getting lost in poor visibility on the moor, so the relief was quite something)! The men in front took a different line but I fixed on bearings and made my way across the moor until I hit the path I knew well from running up as a kid. I realised I’d picked up quite a few places trusting in his directions. It was pretty much downhill from now and my legs really ached but the thought of finally being able to stop and sit. I speeded up as much as I could, between the ice, only to have to stop to wait for a tractor to cross the road. Then I saw the sign for the finish and stopped for a second, before turning the handle and opening the door to the community centre, final CP, the journey’s end. I could barely smile and was close to tears; sheer exhaustion had taken over, what a day. It’s strange how you can keep moving forward but once you stop that’s it, and that was certainly it for me. I must have looked a state. When changed and cleaned up, I arrived at the small canteen and the lady insisted that I sit down and she would bring me all the soup and tea I fancied. I pulled out my phone to tell John ‘your wife is still alive’! He’d had reservations about my adventure. There was no signal though, so I sat and watched as all the weary runners entered. It’s quite a sight, seeing all the relief and pride flood through the doors. Most wobbled, not quite in the present; a few grinned from ear to ear. The overriding feelings were of pride, exhaustion and gratitude to arrive safely home after what was quite an epic adventure. I watched the minutes pass waiting for sight of Susan or Geoff; I was relieved to see Geoff arrive safely back. He’d managed a 15-minute PB in conditions that were tougher than some of his previous 6 races; he was also first in v60 group, by a huge margin of 1 hour 15 minutes. We shared our stories over our tea and soup until refilled and rehydrated, Susan took us back home. Can’t quite express my deep satisfaction having raced this event. Even last year I wouldn’t have dreamed of attempting anything like it. My hardest, most memorable race yet, can’t wait to do it again! Tom Reeves and I like the occasional break from the mud of cross country & this would be our third ‘Tour’. For us the race provides a focus for our winter training and a stern challenge before the Christmas festivities kick in. If you arrive at the start of the ‘Tour’ underprepared then you will suffer – big time! Previous years have served up snow, freezing temperatures, strong winds, rain, hail and darkness but we were still back for more! 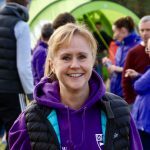 This year it would be gale force winds that would be our biggest problem supplemented by a hail storm in the middle of the day and heavy rain for the last hour or so of the race. It was still dark when we set off from the start at our chosen time of 07.30. We were slightly amused to see the head torch lights of the ‘underprepared’ scattered all over Askham Moor as we got into our stride. Tom and I know the Moor fairly well so we were across quite quickly accompanied by two Tynedale Ladies (Steph Scott & Bev Redfern) and someone Tom had met whilst out BG recceing (Mark Pearson). The only problem was that we were running into the teeth of a south westerly gale! Having such a wind in your face for over four hours tends to sap the energy somewhat and by half way we were both fairly ‘pooped’. However, we were still together, although we’d lost the Ladies but not Mark. During that ‘first half’ the wind had brought us to a near standstill as we crossed the mountain pass of Boredale Hause and recent rains had flooded the fields around Patterdale which meant we had to wade through knee deep, freezing water to get across (the swans seemed to be enjoying it!). Furthermore, as we approached Glenridding, I heard a deep rumble of thunder which seemed to come from Helvellyn itself and within a couple of minutes we were running through rain and hail that was just sheeting down! To add to all this, the ground was absolutely saturated and the steep descent from Sticks Pass had been an uncomfortable slippery slide, although I did manage to stay upright – just! 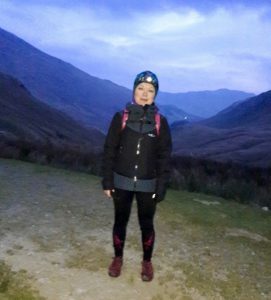 At the start of the ‘second half’, as we passed Grisedale Tarn, the wind was now behind us, and instead of barring our way, it threatened to send flying onto our faces across the rough, rocky path. None the less we pressed on and things got a little easier as the gradient became less steep and the surface more forgiving as we approached Patterdale for the second time. After a further wade through the flooded fields and a wave to the swans we stopped at the check point for a quick cup of tea and ginger biscuit. We were now into the final quarter of the race. Although Tom and I were always ‘in touch’ during this section we didn’t run together much or exchange many words. After 30 miles you really need to dig deep and call upon your own reserves of fitness and determination to carry on. As dusk started to close in, and the rain began to fall by the bucket load, driven on by the still strong wind thankfully now at our backs, Askham Moor finally appeared after more than 8 hours, 35 miles and countless gallons of rain since we’d crossed it that morning. Tom drew level with me, spoke some encouraging words, and pressed on. I knew his two young sons would make his life hell if he didn’t finish ahead of me! It was nearly dark now but I could just about manage to see without my torch to navigate back across the moor and muster up the energy to pass a couple of competitors on the final run back to the starting point in Askham village. What a day! 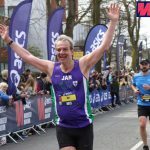 I’d finished in 8 hours 51 minutes – much quicker than I thought I would have managed when I was half way round and only 3-4 minutes slower than last year when conditions were considerably better. Tom had come in a couple of minutes ahead of me and Mark about 5 minutes behind. We were all pleased with our performances and delighted to have finally finished such a gruelling and punishing event. If only someone could bottle that feeling – they’d make a fortune! This race is in its 3rd year and is a race for runners who are able to navigate and look after themselves in the mountains in difficult conditions. It is always run on the shortest Saturday of the year so being able to move quickly is an advantage. I think its going to become a classic. However as I sat in the Travelodge the night before the race watching the weather I really did not want to do the run the following day. Torrential rain and strong winds! Err no thanks! I did this event in 2011 with Geoff Davis and I was doing it again with Mr Davis. We set off from Askam village hall at 7.30 in full waterproofs top and bottom and finished many hours later in full waterproofs. We set off with another runner Chris Little who runs with NFR and set off with us the previous year. The weather was wet but not as wet as expected and although the wind was cold it was not too strong. The race itself is 38 miles on pretty good tracks most of the way passing through Howtown on Ullswater then Patterdale via Boardale Hause (the first big climb of the route). 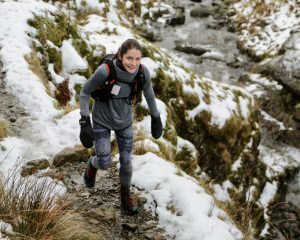 Timing is pretty important as checkpoint 2 at Patterdale does not open till 9.30 am and you must pass back through it on the return journey no later than 4pm. Our timing was pretty much spot on on the way out and we hit the checkpoint just after 9.30 going at a nice comfortable pace. We stayed together as far as the climb up sticks pass when myself and Geoff pulled slightly ahead of Chris. 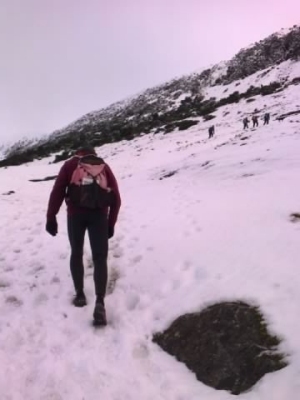 I felt the cold for the first time as we hit the snow line and spent the next 15 minutes or so running through ankle deep ice cold water. I contemplated putting more clothes on but didn’t bother deciding the decent to Thirlmere would warm me up as we lost height. It did. Heading out from checkpoint 4 at Stanah Gill Geoff jogged along eating a gel while I chomped on a pasty can you guess who enjoyed their top up more? Myself and Geoff swapped taking the lead all along Thirlmere which is always longer than expected. I pulled away from Geoff on the steep climb up Raise Beck to Grisedale Tarn, I was going quite well till I took a tumble on the run down from the tarn to Grisedale and back to Patterdale. I somehow managed to trip on the worst bit of ground clattering my dodgy knee. I lay on the ground sure I’d smashed my kneecap. After a couple of minutes and several expletives I took a few tentative steps and boy did they hurt. I kept at it and managed to pick up the pace catching a group of runners I’d been tailing for some time. The rest of the run from Patterdale is the reverse of the start of the race and fairly runnable once you’ve got back up over Boardale Hause. By the time I got to Howtown I knew I was going to better my time of last year and so I did finishing in 8hours and 25minutes. 35 minutes better than 2011. This was down to better running conditions and not better running I might add. Geoff came in not long after me bettering his time by even more than me. After race food was fantastic loads of home baked cake lots of mugs of tea and very tasty homemade carrot soup. This is a great event and clearly others agree as the race has doubled in entry numbers since last year. I think it might be a regular for me. ‘unsuitable applications will be rejected’! The organiser, Joe Faulkner (one of the most competent ‘Fellsmen’ in the country), didn’t reject my application, even though I haven’t done anything really ‘mega’ for three years, and so I was in! Five weeks of intensive training later, interrupted by a heavy cold, Tom Reeves and I were in Askham village hall at 7.30am. It was a dark, cold and frosty morn as we waited for Joe to tell us our kit was sufficient and that we looked competent enough to be allowed to run in his race. The event was a time trial so you could start at any time between 7-9am and Tom and I had decided to set off just before it got light. 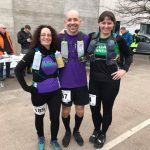 We were joined by NFR friend Chris Little who’s Bob Graham I had helped out on over seven years ago (where has that time gone?!). The first mile or so was on road that was covered in frost and black ice and proved challenging although we all managed to stay upright. The next few miles over Askham Moor and down to Howtown were frosty and icy underfoot but went over quite quickly. We split up briefly when a route choice presented itself. The younger men chose what proved to be the longer, slower option and I was left waiting for them at the checkpoint for a couple of minutes, much to my delight! The first ‘up and over’ at Boredale Hause had a bit of snow on but nothing to speak about and, apart from Tom and Chris’ endless chatter, things went quite smoothly, although not ice-free, till be got to the Helvellyn Youth Hostel. Chris stopped to put on his snow spikes and Tom and I continued together. From here the ascent to the highest point of the race, Sticks Pass at 750m, began and we were into deep snow immediately. As we ascended, the cloud did the opposite and soon we were in near whiteout conditions slogging up a steep slope through deep snow with the wind in our faces blowing tiny snowflakes into our eyes. After what seemed an eternity we finally ‘topped out’ onto the pass and began the long slippery descent to Thirlmere. I’d been very glad to have Tom with me over this difficult section and really appreciated his morale boosting comment when we finally reached the bottom of the slope: “well that’s 16 miles done, only another 22 to go!” We parted company at this point, but not because we had a spat, Tom was just moving more quickly than I was. So now I was on my own and knew that, although the most difficult section was done, the next 22 miles were going to be a challenge. The race had also been billed as taking place on the ‘shortest’ weekend of the year and now, at around 4pm, dusk was starting to fall. I’ve run through the night across the fells many times so that wasn’t a problem. However, I prefer running on ‘night vision’ rather than using a head torch but when I started to trip over rocks and clumps of reeds I knew it was time to turn the damn torch on. 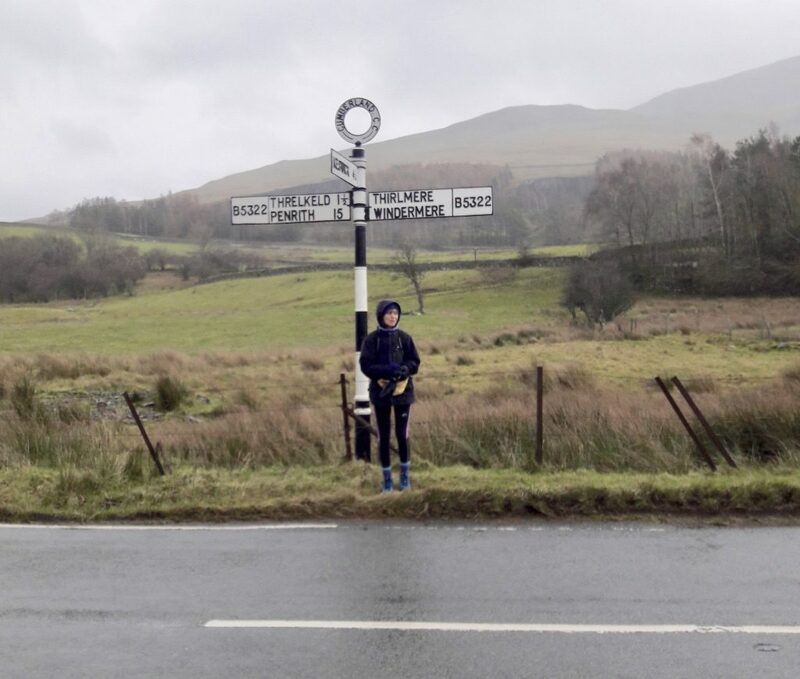 The last couple of miles over the near featureless Askham Moor were going to be tough in the dark but I had a ‘pre-prepared’ bearing and I could still make out a key landmark in the gloom, so I knew where I was going. 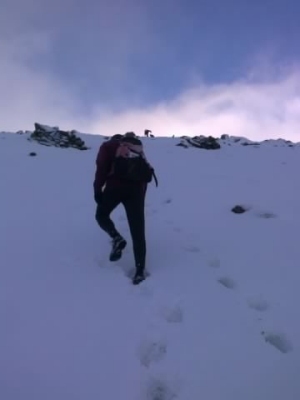 However, the traverse of the moor was frustrating as it was frosty, icy and consequently very slippery. Nonetheless I managed to keep to the track and eventually came out onto the road into the village. It was with great relief that I ran into the Village Hall and handed my control card to Joe Faulkner who congratulated me. As my eyes became accustomed to the bright lights I could see Tom sipping a cup of tea. I must have looked a state ’cause he kindly offered to get me some soup and tea. As we chatted with a couple of other friends Tom remarked that I had done a good time – for someone of my age. Thanks Tom, for that, and for a great weekend! I’d heard about this event last year but never got round to entering it so I was pretty keen to have a go this year. I’ve done a few long runs so felt I could do the distance the main thing about this race is the time of year. The days are short and the weather can be challenging! Geoff D was coming across with me so we both kept our eyes on the weather in the week leading up to the day of the race. We drove across on Friday night so we could get a good start on Saturday morning. 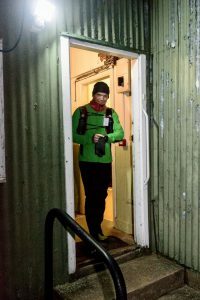 The race HQ and start/finish of the race was in Askham Village Hall it was dark and icy when we arrived I’d had my cold rice pudding and was almost raring to go. The weather reports were more positive so we were hopeful of a good day out. Geoff and I decided to set off together and see how the race panned out, we headed off at 7.44 as the sky was just beginning to get light. I almost went over on black ice as we left the hall not a good start! The road up to Askham Fell was very icy and we toddled along barely above walking pace. One of Geoff’s NFR buddies Chris joined us over the initial part of the race. Once we were on the fell it we were able to get running and warm through a bit. 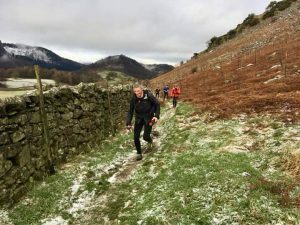 The first leg takes the runners along the side of Ullswater to Howtown and the up to a self clip at Martindale Church. 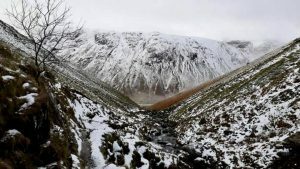 At Howtown there is an option of following the road or keeping to the fellside. I opted for the off road and Geoff took the road. Surprise, surprise he got to the church first with a rather satisfied look on his face! We had a mile or two of road along Boardale then headed up on a steep bouldery footpath to Boardale Hause and lots of snow. The weather was still being kind to us and there were fantastic views of the route to come. The next checkpoint was in Patterdale and on the run down we started to get overtaken by some of the faster runners. It was quite icy and care had to be taken but I think we all made it down with no falls (yet). 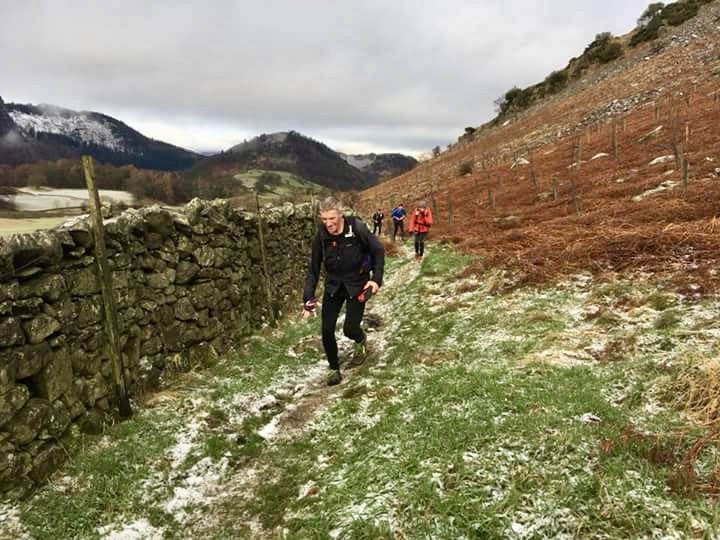 We got to Patterdale bang on opening time of the checkpoint and ran on through to Glennridding followed the road up to the youth hostel and what would be the longest climb to Sticks Pass the highest point of the course. Chris stopped just before the climb to put his brand new micro spikes on. We kept on going expecting Chris to catch us up with the added assistance of spikes. We passed quite a few skiers on the way up as the snow got deeper. This was what I was hoping for, lots of snow and I got it! We made good progress and got to Swart Beck Footbridge and a marshal who deserved a medal for being up there. We clipped, Geoff put his jacket on and we were off for a long slog in deep snow and a virtual whiteout. It felt like a long time till we dropped out of the cloud and got our first views of Thirlmere. The run down to Stanah Footbridge was very slippy and I fell over a couple of times on the steep hillside. Geoff took a bit longer to get to the checkpoint and I don’t think he was impressed when I mentioned we only had another 22 miles to go. I felt quite tired after the run through the deep snow so refuelled on home made flapjack as I jogged along under Whiteside to Swirls Car park and checkpoint 5. I was greeted by the splendid sight of Santa Claus and the sound of bells ringing which was very festive. Geoff was around a minute behind me as I entered the woods along the side of Thirlmere. I passed a few runners and one or two runners passed me, the racers with higher numbers had started after me so I was able to get a roughish idea of where I might be in the race. 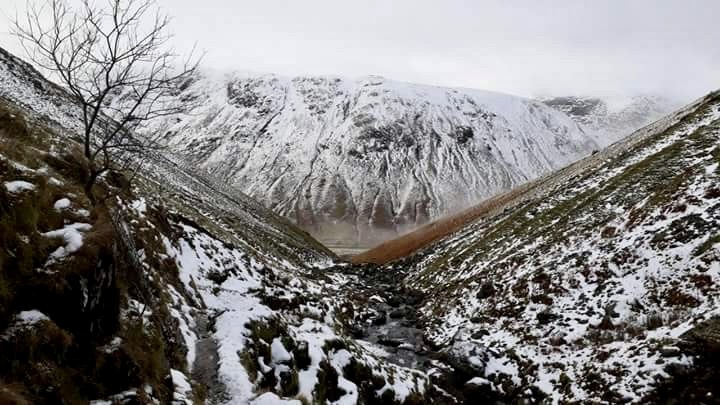 The climb up Raise Beck to Grisedale was a tough one but it seemed to pass pretty quickly, I was now heading back in the direction of Askham, I was over half way and the next checkpoint would be Patterdale. 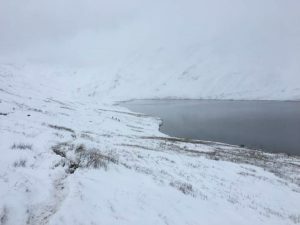 There was deep snow again heading past Grisedale Tarn and I managed another couple of falls. I began to feel quite cold for the first time since the start of the race. Time to eat more and pick up the pace. I noticed a young lad tracking behind me on the descent down Grisedale. We got chatting and he informed me in no uncertain terms that he was feeling the pace. I suggested he run along with me and we duly ran the rest of the race together. He (Tom) had started and hour and 10 minutes after me so he had made really good progress (he finished in the top 20). At Patterdale I ate my chicken and ham pastie which I’d carried all day and was determined to eat. It wasn’t too bad actually, and gave me a boost of energy on the final major climb back up to Boardale Hause. It was now 3pm is and the soon to be setting sun looked fantastic it had been a great day out and only 9 miles to go. The final checkpoint was Martindale Church again and I took Geoff’s route back down the road, and yes Geoff, it was quicker. Tom was struggling with cramp but managed to hang onto me with a bit of encouragement. It was just beginning to get dark as we ran across the final stretch of Askham Fell but the head torch stayed in my sack. I was pleased to get back in (almost) daylight and even more pleased to get in dead on 9 hours. I was hoping for under 10 hours so … job done! The tea and soup were flowing back in the village hall and the cake was very good too. 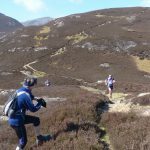 I managed to cramp up while taking my fell shoes off, but then again I wasn’t the only one judging by the grimaces of my fellow competitors. Geoff arrived in due course and looked very pleased with himself. Chris arrived a short while after, so we were all safely home. Anyway we were soon heading back to Durham after a great winters day on the fells. Beats Christmas shopping every time.